How can Delhi encourage more cycling? Photo by anna. New York City last month announced the launch of its new bike sharing program. What is the feasibility for bike sharing in a city like Delhi, where during post-monsoon season, biking is a more affordable and accessible transport mode? Bike sharing could be huge mobility investment, and a way to help alleviate air quality, climate change and congestion issues. Delhi already has cyclists of all kinds. There are bicycle riders, who generally own their cycles, as well as cycle rickshaws, who dominate older parts of the city and the suburbs like Gurgaon. There is also a new breed of electric cycle rickshaws, which run on electric batteries. 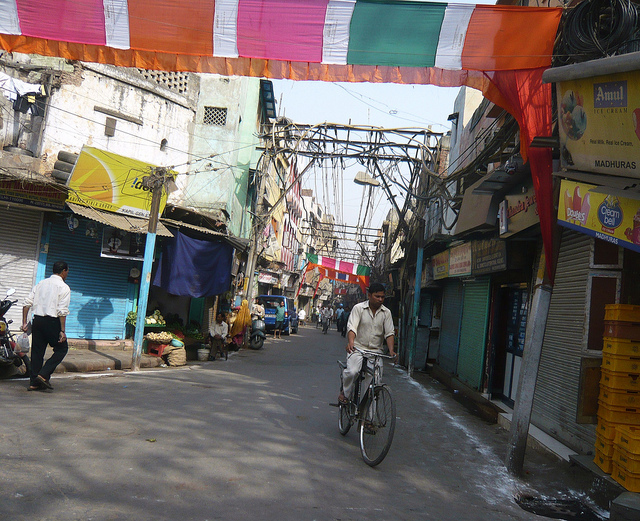 Once upon a time, blogger Magali Mander says, Delhi used to have separate lanes for cyclists. But then, “the space was taken over by cars and planning was taken over by those who thought a modern city needed wide streets for cars rather than lanes for its inhabitants to walk on, or ride on their bikes.” Clearly, non-motorized transport needs to be prioritized in Indian cities, whether by constructing shaded walkways, elevated bike paths, or safer and well-maintained pavements. In terms of health impacts, Tiwari notes that air pollution and traffic injuries are the two major and adverse impacts of transport land use policies evident in the city. Increased air pollution in Delhi, which affects the health of all citizens—rich and poor, equally—has become a major public concern and has been recognized as a public health issue. One way to improve this situation would be to promote cycling and walking, along with the development of facilities that make cycling safer. Targeting the needs of cyclists is one of the key mobility challenges in Indian cities. The management and monitoring of a bicycle share program would likely be difficult in a city as large as Delhi. But there are perhaps lessons that can be drawn from the existing rickshaw sharing and rental industry. It would require city-wide infrastructure changes, such as installing bike racks, as well as educational outreach, like promoting road safety. It is also perhaps not something that can easily be afforded by the local government who are now tasked with many responsibilities. Distances that people travel in the city are often not short, but having cycle share systems that feed into the subway could be important. Additionally, bike riding is not convenient to everyone; women in sarees for instance are unlikely to cycle, and people that are elderly, disabled and handicapped once again become excluded from the cycling program. Cultural norms exist and would have to be challenged. An extremely targeted but affordable scheme could form part of an entire package aimed at improving public health and mobility, with improvements to lighting, pavements and segregated cycle lanes. There are also external inconveniences to consider—the sun, the dust in eyes—which means educating the public about wearing helmets or protective visors. Biking would need to come with a slew of its own ammenities to ensure safety, but it would be in the interest of the city and its overall health. A cycle share program would have to be largely seasonal because in the summer, cycling is uncomfortable in the summer heat, as well as during the rains. But elevated bike routes and walking paths constructed with shading are a possible solution. Clearly, architects, planners and policymakers need to be in a dialogue with city’s citizens to explore these opportunities. There is potential in a project by a Delhi-based architecture firm Morphogenesis, called the Delhi Nullahs project, which would integrate several modes of non-motorized transport. The project seeks to establish a green and sustainable network through the city, connecting older heritage parts through walking and cycling routes. This kind of endeavor would make mobility across the city more sustainable. But cycling is not just an option for the urban poor; it is a valid mobility option for many other Delhi residents because of its many benefits.